Spring break is coming up…how did it creep up so quickly? 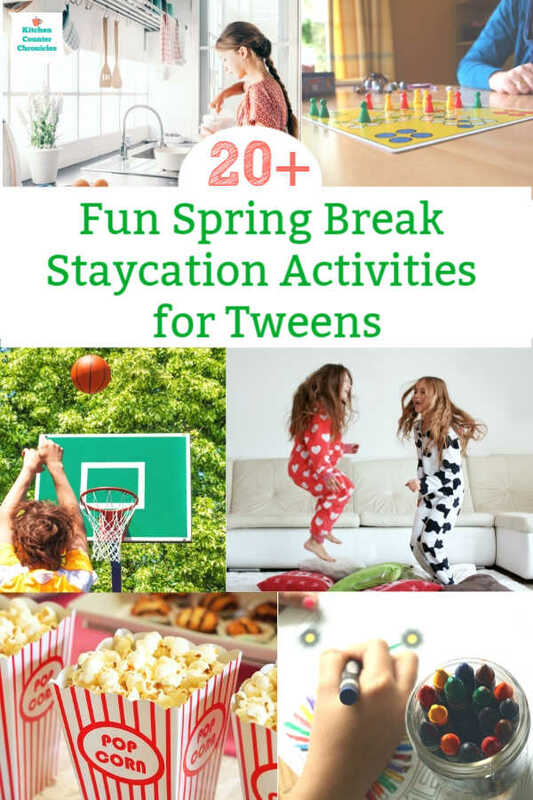 We’ve pulled together a collection of fun activities to do with tweens over spring break. As usual we will be hanging around home over the break. In past years it has been pretty easy to occupy my daughters’ time. A couple of crafts and games and the week would quickly pass by. 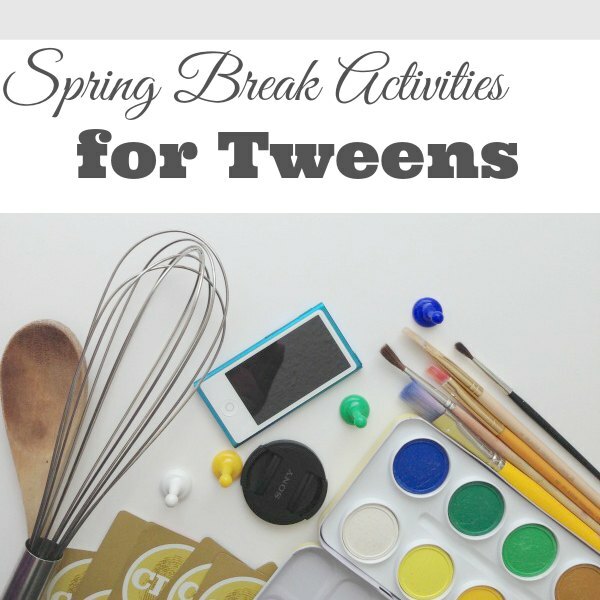 Finding fun activities to do with tweens over spring break might be a little different. As my girls get older, their interests are changing and how they want to spend their time is changing too. If you have a tween, boy or girl, in your home then you know what I mean. So, I’m getting prepared, doing a little planning. 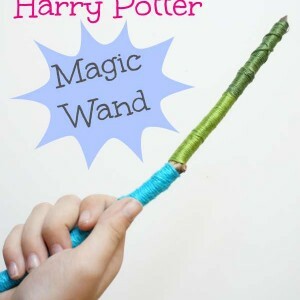 I’ve put together collection of activities to do with tweens over spring break. Ask Your Tween – Tweens are looking for a little respect, so give it to them. In the past I might have taken the sole responsibility for planning our break activities. This year, I’ll be looking to my tween for her ideas. As long as they aren’t totally unreasonable…we won’t be booking a last minute trip to NYC…we should be able to incorporate her ideas into our agenda. Game Day – Theme days are an easy way plan your time. For a tween friendly game day mix things up a little. Have everyone pick their favourite game…mom, dad and kids. The games don’t have to be board game, they can be video games. Everyone has to play each game. I am quite possibly the worst video game player on the planet…how fun would it be to see me attempt Minion Run. Keep score or don’t. Turn the day into a tournament of champions…or make it all about fun. 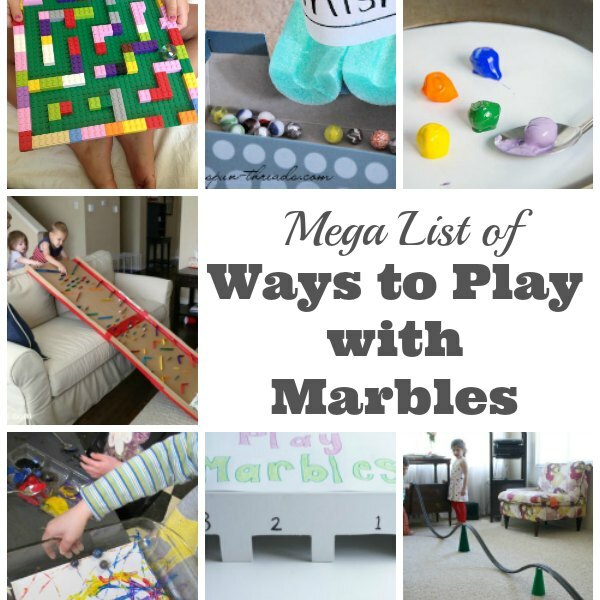 Check out our MEGA list of ways to play with marbles. You’d be surprised how much fun you can have with this old fashioned toy. Get Outside and Play – Pick an outdoor activity that everyone can participate in. Tweens spend a lot of time inside classrooms all year long…spring break is the time to get outside. What is your tween interested in? Sports – go ice skating, sledding, skiing, swimming, play soccer, baseball or basketball. 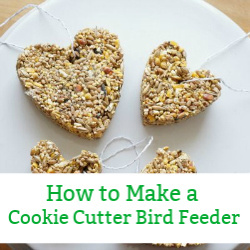 Do you have a nature tween – take a nature hike, go bird watching, head to the beach, pack a picnic lunch or go on a scavenger hunt in the woods. We have a big selection of scavenger hunts, our Earth Day scavenger hunt is my kids’ favourite…and it doesn’t have to be Earth Day to do it. Is your tween uninterested in being outside? Start with small outings; spend a little time cleaning up your backyard or garden, go for a quick walk to the corner store…find a way to get outside. Let the Tween Meal Plan – I think most parents can get behind this one. 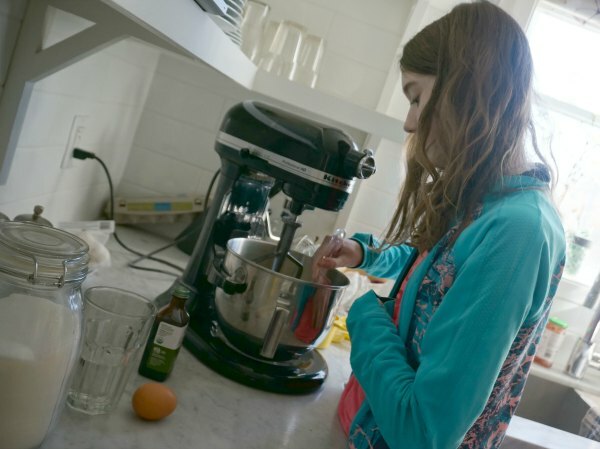 Let your tween plan the day’s meals. 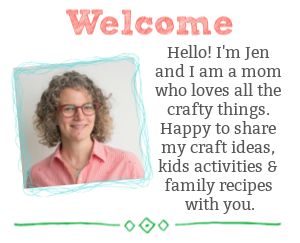 Give your tween full run of the cookbooks, the grocery list and the kitchen. This is a simple way to start teaching your tween valuable life skills. If your tween needs a helping hand, then reach one out. At the end of the day, sit down and enjoy your child’s creation. My 12 year old announced that she wants to make a lemon poppy seed cookies during March break – I cannot wait to enjoy the fruits of her labour. Another super delicious kid-friendly recipe is our chocolate marble cake. 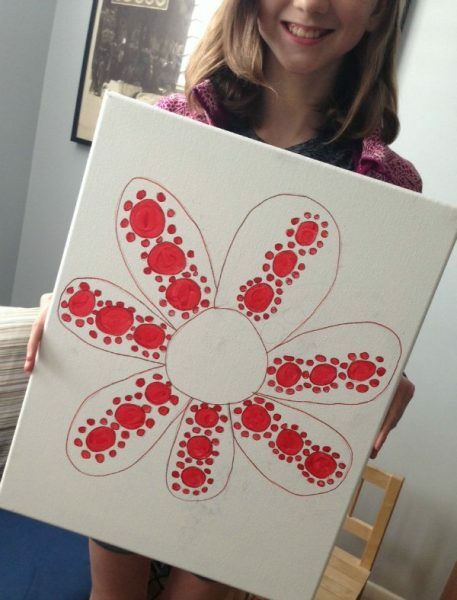 Young Artist Day – Take your tween to an art gallery, any art gallery. Open your child’s mind to the visual arts. 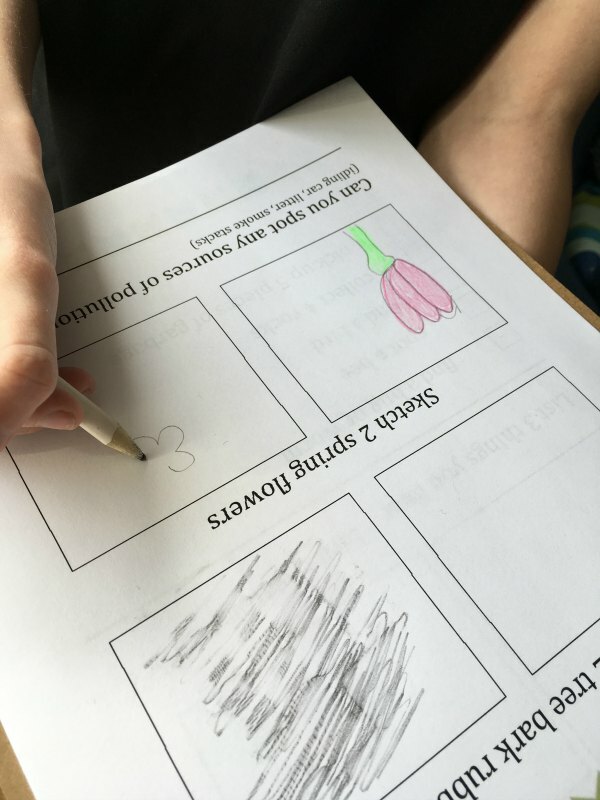 I’m telling you, all children benefit from exposure to art. Hand the camera over to your tween. Encourage your child to take pictures (without the flash) of his favourite pieces of art…he can use those pictures later. An easy way to extend the trip to the gallery, is to stop at an art supply store. Take a look at the pictures of his favourite pieces of art from the gallery and pick up some supplies. Bring art home. 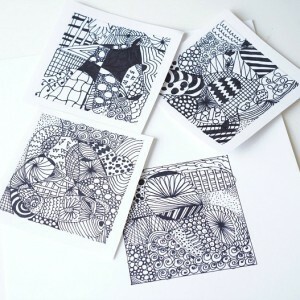 Pick up a canvas, a sketch pad, paints, pencils, whatever. Get home and get arty. Need some inspiration, check out our Great Artists’ posts. See how we were inspired by Picasso, DaVinci, Hockney and Cezanne. Dance Party – Did you know that YouTube is filled with fun karaoke versions of songs…new and old. Make a microphone out of a hairbrush, sing and dance your heart out. Want to kick up the fun. Throw a list of favourite songs into a hat. Take turns pulling titles out of the hat…whatever song you pull, you have to sing. Pyjama Day – Kids love pyjama day, seriously. To up the tween love add painting nails and styling hair to the day and you’ve made your tween girls dreams come true. Fort Day – Okay, my kid is a tween, not a toddler. What we often forget is that tweens are stuck in the awkward zone between kid and teen. Help your child embrace her younger instincts. Kids love building forts. Bring out the blankets. Build a fort in the living room, basement, bedroom or backyard. Extend the fort building by encouraging your child to name the fort/building, create signage. If the fort is a shop then make the accessories. If the fort is a tree fort, then make some bugs and birds for the fort. Don’t knock the fort down quickly. Although it might be taking up most of your living room, let it stand. Watch how the kids keep going back to the fort. They really are magical. 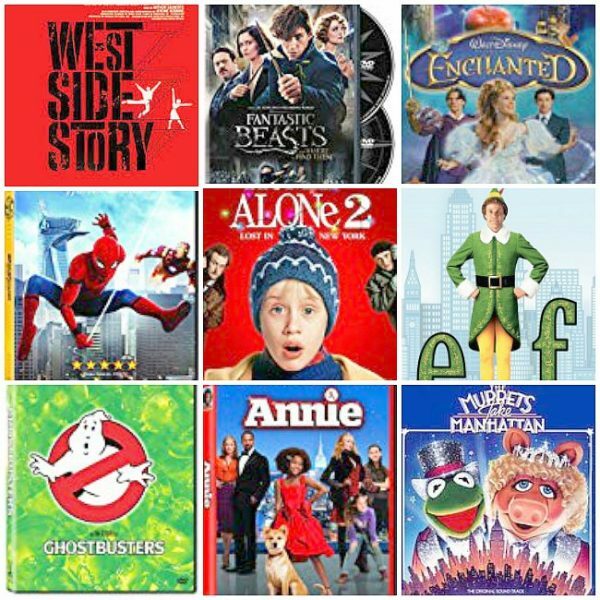 Movie Day – Did I mention that I love a theme? Pick a movie to watch, pretty simple. What about making a movie? Get the kids to write the script, make the props, do the filming and screen their movie at the end of the day. Make some popcorn and watch their movie before the feature film. If you have Netflix, check out our list of the best shows for tweens. Or, take a trip to New York City with these big apple movies. Phone a Friend – Don’t forget that your kids’ friends are on spring break too. Trust me, their parents are struggling to find ways to occupy time too. Plan a day when friends come over to play. Give yourself a break and let the kids play. I am really looking forward to this spring break. I enjoy spending time with my girls. We always seem to find fun things to do with our time. Our break actually starts tomorrow…which means we will be sitting down tomorrow morning and have a family conference to plan the week ahead. I have always found that having some form of a plan helps when the kids are home for a long break. Wish me luck – and good luck to you too. 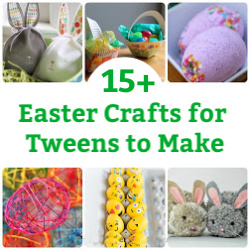 More fun crafts and activities for tweens…. Thank you so much for this list! The world is full of creative ideas for babies, toddlers, teens, but the poor tweens are yet again stuck in the middle. My son and I will do everything on this list for spring break- hope you have more great tween ideas for summer! Awesome! We are already zipping our way through the list too. 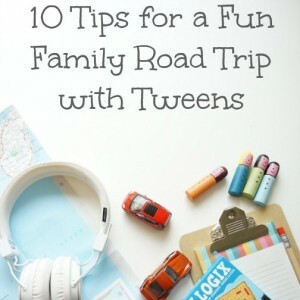 Hope you have a great break…and I will certainly have a fun list to inspire a fun summer with tweens. Looking at this list, I would gear this towards younger children, like 6-10 (yes, I know 10 is considered a “tween”). Those are just my thoughts. I am younger, and as a young teen, I know that when I was younger, I definitely would have liked to do these things, but not now. From my experience, quick and fun road trips always are a good way to go, as well as trips to the beach and going shopping or hanging out with friends. Make sure they also can have some time alone, to do what they want, weather it be hanging out with friends or just having some alone time. Hi Amanda. Great points about tweens wanting to just hang out with friends. That definitely fits under the “phone a friend” section. Thanks for your input. she will be nine in october..and i am finding her interests are already changing…thank you for some great ideas for the rest of march break..
we do a pajama theme here on our saturday nights with movies…and snacks….